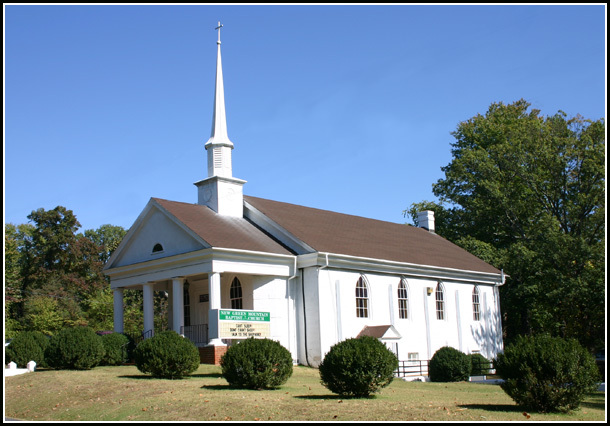 Comments: New Green Mountain Baptist Church is an African-American church founded in 1896 and located at 7259 Porters Rd., Esmont, Virginia. Its cemetery is located at 7725 Porters Rd. and adjoins the cemetery belonging to New Green Mountain Baptist Church of Esmont. As of August 2017, New Green Mountain Cemetery contains approximately 171 gravestones and over thirty graves marked with stones or temporary markers whose inscriptions are now illegible. Directions to New Green Mountain Baptist Church Cemetery from Scottsville Museum: from Scottsville Museum: Go West on Main Street and turn right on Valley Street. Continue up Valley Street which becomes SR20. Turn left on Irish Road (SR6) and travel 5.7 miles West. Turn left on Porters Rd. (RT 627). Drive 0.6 miles, and New Hope Baptist Church is on the left. New Green Mountain's side of the cemetery starts around the row of trees looking south from the church parking lot. Following is a July 2007 listing of the extant gravestones at New Green Mountain Baptist Church Cemetery as prepared by Rob Manoso, an intern at Scottsville Museum from the Institute for Public History at the University of Virginia. This listing was updated in August 2017 by Connie Geary. Women are listed by their married names. Also, asterisks (*) that appear before names denote veterans. Anna shares the Bridgeford surname gravestone with Thomas G. Bridgeford. Thomas shares the Bridgeford surname gravestone with Anna E. Bridgeford. 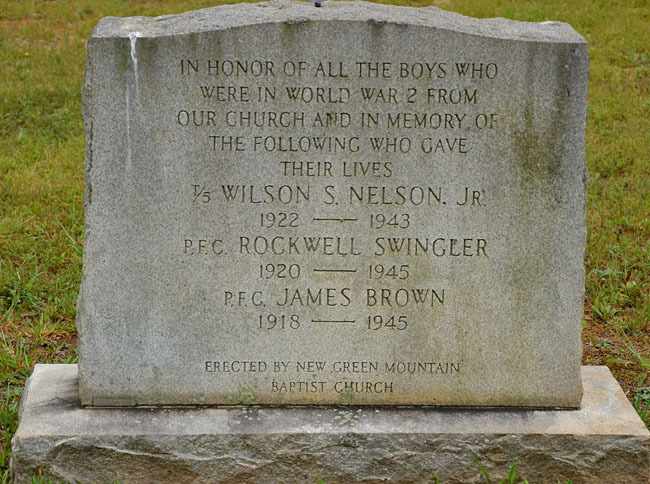 A memorial, erected by New Green Mountain Baptist Church, to honor three U.S. veterans, Wilson S. Nelson Jr. (1922-1943); *Rockwell Swingler (1920-1945); and *James Brown (1918-1945); who were members of this Church. All three soldiers were killed in action during World War II.